Clothes for New Zealand glacier walks should be chosen with care. 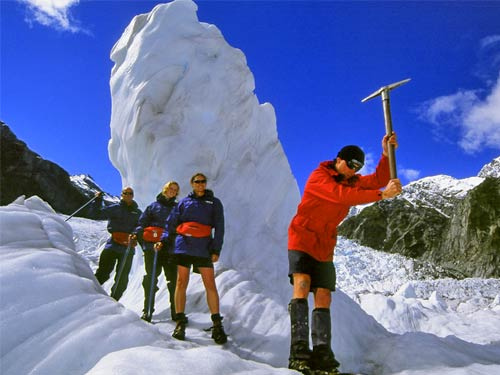 For a lot of travellers going down the West Coast of the South Island to Fox and Franz Josef glaciers, landing and walking on a glacier, is a must-do, but it’s usually only the guides that wear the shorts! 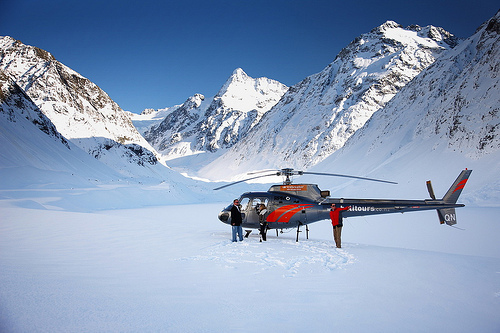 Generally visitors will either do a standard helicopter flight into the ‘Neve’ at around 2500 metre with an ice landing (for about 5-10 minutes) or they’ll join a guided walk with two short helicopter flights. This is called heli hike and generally takes about 2 hours on the ice. On this heli hiking option walkers need to prepare their clothing well. 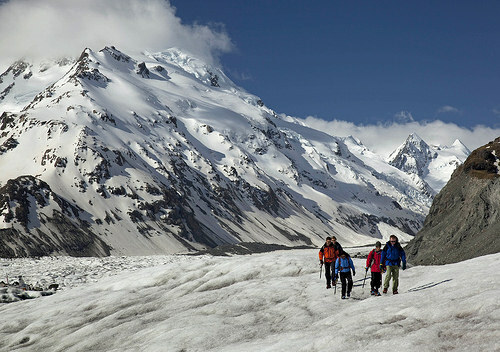 Temperatures and weather conditions on a glacier in New Zealand can change rapidly. At any given time the sun may be shining and when the strong sunlight reflects off the ice, you’ll get hot and sweaty. At this stage, you might even be happy to walk on the glacier in a t-shirt! But the minute the sun goes, the temperature plummets and it’s like standing on top of a fridge. And if you’re moving around (say waiting for your helicopter to arrive) it can get extremely cold…fast. The perfect solution is the ‘onion’ clothing system – peeling on and off clothing. Using the “onion” method requires that you wear layers of clothing that can easily be peeled off (e.g. t-shirt, sweater, rain jacket, hat, hand-gloves and sunglasses. Jeans are not recommended – if the cotton gets wet or damp, you’ll start sweating. Non-cotton trousers such as Hiking trousers, are the best. Sunblock is essential and sunglasses are a must-have. The location alpine guide operator will provide you with a walking stick, sturdy mountain boots, crampons and a couple of socks (yes you should use two pairs of socks to prevent blisters!). If you don’t have a good rain jacket, use one of the operator’s “yellows”. The saying goes, “there is no bad weather, only bad equipment and clothing”. Listen to your alpine guides and enjoy yourselves.